Interview with the Dragon Charmer ! Our sewing chat group has been so inspiring to me. From time to time I see things there I would never have discovered otherwise, different aspects of sewing I've never tried. Many times I'm just so impressed with all of the design, sewing and fitting skills from the members, but then other times I'm just blown away! We have one member, Sabine, who is fairly new to sewing and only recently started to use a sewing machine, so when she showed us photos of her first doll she made – well, the internet went crazy! 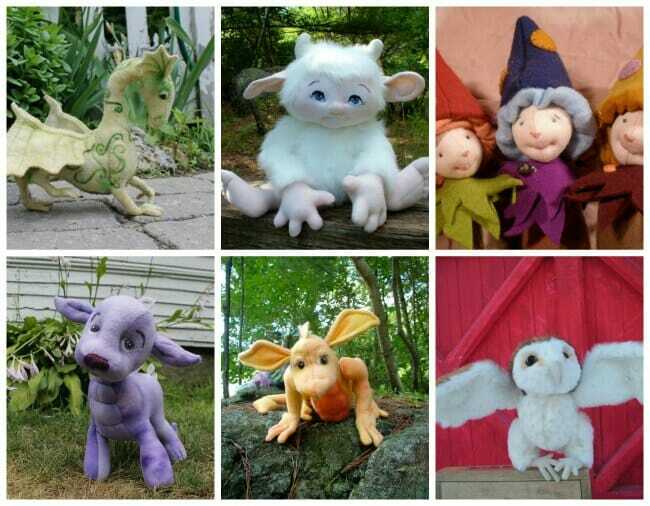 Since then she has been taking our breath away regularly with her gorgeous sewn creatures and dolls of all sorts, so naturally we were all clamoring to know where she got the patterns from. Etsy comes up trumps again and she pointed us to the Dragon Charmer, Jennifer Carson. I urge you to go and take a look at her store – those are just mind-blowing! 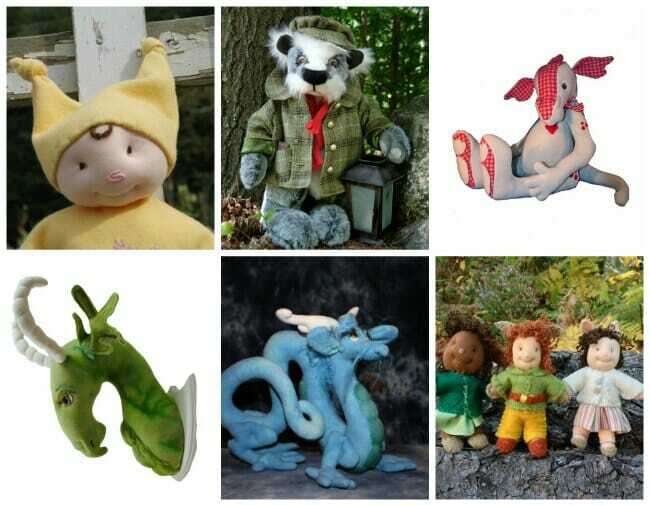 All of them are available as instant download PDF patterns so you can make these yourself! Honestly – can you imagine sewing something that fabulous! So I asked Jennifer if she would just give us a few tips on starting out with her patterns, because some of this might be new to us. Especially the fabrics she uses, which aren't necessarily commonly used in the sort of clothing, quilts and bags we might otherwise be sewing. Jennifer agreed to join us and share some tips below. She's also offering a 15% discount on her patterns too – check out below. There are many fabrics to choose from when it comes to making dolls, and all have their rightful place. Cotton knits are fabulous for some doll patterns, while others work well in wool felt or doe skin. About nine years ago, early in my doll making career, I was introduced to woven wool—wool threads woven together to make lengths of fabric. I bought a few hand-dyed pieces and made my first dragons from this fabric. The Bookwyrm Dragon was the first dragon sewing pattern I published. I have about 60 sewing patterns in my stable now! Instantly, I fell in love. The women at the store encouraged me to start dying my own, and I did. Dying my own fabric brought a world of color possibilities to my fingers! Not only that, but I could needle felt features. I didn’t have to use child safe eyes, because needle felting the eyes made them part of the fabric, and therefore, no risk of choking. Another great thing about using woven wool is that it is sturdy, but forgiving, so it turns nicely. It is also soft and warms to the touch quickly, making it a great choice for dolls that children will snuggle with. Dyeing wool is also a very easy process. I share how to spot dye wool fabric on my blog, just follow this link. Huldfrejya, a troll queen. One of the characters from my newest children's book, Tangled Magick, the sequel to Hapenny Magick. Made from hand-dyed wool. If you don’t want to dye fabric using a chemical dye, there are many natural dyes you can use that are commercially produced, or a quick search on the internet will provide you with directions on using plants, etc. 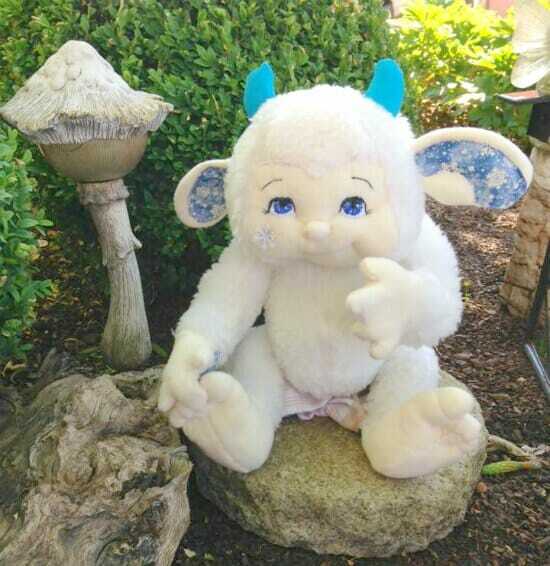 Pippin Poorbelly is made from hand-dyed cotton fleece. Woven wool is only made by a handful of companies in the United States nowadays. I purchase mine from Dorr Mill Store. I usually buy an 8-yard bolt for around $150.00, but they sell smaller quantities and already hand-dyed fabric as well. 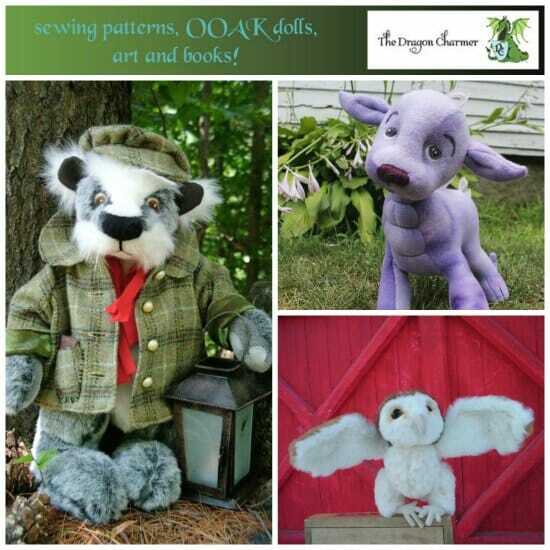 If you choose to order from them give the store a call, they are familiar with my patterns and can help you out. The cotton sweatshirt fleece is easily found at your local fabric store (just make sure it’s not too thin—if, when you stretch it, you can “see” through it, you’ll want to find a higher quality fabric). And, if you’d like to give a Dragon Charmer pattern a try, use this discount code for 15% off any $10.00 or more purchase on Etsy! Just enter SEWEASY2015 at the time of checkout before August 30, 2015. Jennifer Carson is a children's author, creature maker, and all-around creative powerhouse. She lives in New Hampshire with her husband, four sons,three goofy dogs, and a ferret. Visit her online at www.thedragoncharmer.com, friend her on Facebook, or follow her on Pinterest. One Response to Interview with the Dragon Charmer ! Wow, these are absolutely adorable! I love all of the tips for using the woven wool. Thanks for sharing!